A second firefighter has died in Cyprus from injuries sustained while trying to tackle one of the island's biggest forest fires in years. Marios Aristotelous, 44, was in a vehicle which overturned, also earlier killing Andreas Sofocleous, 49. Cypriot President Nicos Anastasiades expressed his "great sorrow". 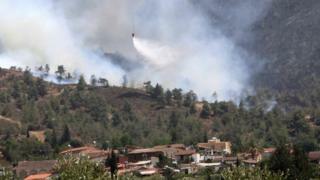 Greece, the UK and Israel have contributed aircraft to fight the blaze raging in the Troodos mountains. France and Italy are expected to do so too. Cypriot police have warned holidaymakers that Canadair planes will be refilling with water in the resort area of Larnaca Bay. The water-dropping planes resumed their efforts to quench the blaze on Tuesday morning, the Cyprus Mail quoted Forestry Department spokesman Andreas Christou as saying. "Forces are deployed around the perimeter of the fire," he said. "The main fronts [of the fire] are active, but because there is no wind we are making a great effort to extinguish the fronts," he said - though thick smoke was complicating the task. Some 10 sq km (3.9 sq miles) of forest have burned so far, the department estimated. Police suspect it was started by a 12-year-old boy playing with a cigarette lighter. Cyprus frequently suffers forest fires during its hot summer months, but these are believed to be the first firefighter deaths for years. President Anastasiades said the state would "stand by" the relatives of those killed.